Metal fabrication is the process of forming metal structures and assemblies from raw metalwork pieces. This process is referred to as a value-added service, as it completely deforms the raw material and develops a completely new structure by using several procedures such as metal welding, metal machining, metal forming, and metal cutting. Metal fabrication workshops offer multiple value-added services under a single roof such as welding, cutting, machining, and shearing. Metal fabricators offer additional value to clients by providing complete services under one facility. Original equipment manufacturers (OEMs) iron and steel manufacturers, building contractors, and value-added resellers enter into contracts with metal fabrication workshops in order to satisfy their metal fabrication needs. Various ERP technologies and software are employed in the metal fabrication market. This makes data easily accessible and accelerates the decision-making process. Increase in usage of computer-aided manufacturing technologies is helping companies operating in the metal fabrication market improve their operational efficiency and enhance production. These advancements in technologies are anticipated to drive the global metal fabrication market during the forecast period. Advancement in robotics and automation tools boosts the application of robots and automation tools in metal fabrication. Currently, automation is used in metal fabrication to increase efficiency and lower labor costs. Increasing demand for automated manufacturing systems in the metal fabrication market helps in making manufacturing facilities safe, as all critical jobs such as welding and cutting are carried out by robots. Apart from this, automation tools such as laser saws make it easier for fabricators to manufacture metal parts that are precisely cut. Fabricated metals are used in various sectors such as automotive, oil & gas, construction, aerospace, agriculture, consumer products, medical devices, and military & defense. As these end-use industries are diversified, effects of cyclic nature of the metal fabrication market are mitigated. Growth of end-use industries such as aerospace and automotive is anticipated to drive the metal fabrication market in the next few years. The global aerospace industry is witnessing expansion with increasing number of passengers. In Asia Pacific, the demand for commercial aircrafts in increasing. For instance, 1740 commercial aircrafts were delivered in the region in 2017, which is 1.5% more than the number of aircrafts delivered in 2016. The automotive industry in Asia Pacific is witnessing growth, also due to improved living standards and risen per capita income in developing countries such as China and India. According to the International Organization of Motor Vehicle Manufacturers, the number of vehicles produced across the globe was 97,302,534 in 2017, which is 2.36% more than the number of vehicles produced in 2017. All these factors are anticipated to drive the metal fabrication market during the forecast period. Finding skilled labor is becoming increasingly difficult, as metal fabrication market is becoming technologically advanced. According to an OECD report, skill shortage is a rising issue across the globe. Countries such as Japan, India, Brazil, and the U.S. are facing severe shortage of skilled workforce despite high unemployment rates. This is anticipated to hinder the metal fabrication market in the near future. Rapid advancements in additive manufacturing (3D printing) technologies are leading to reduction in the time taken to print an object. Additive manufacturing is a highly flexible manufacturing process with high scope for customization, which makes it easy for fabricators to design and manufacture complex parts. This type of manufacturing is not utilized on a large scale. However, additive manufacturing is anticipated to be commercialized in the near future, which is expected to change the dynamics of the metal fabrication market. Thus, lack of skilled labor and advancements in the field of additive manufacturing are anticipated to restrain the metal fabrication market in the near future. Demand for fabricated metals from OEMs has been fluctuating. It is in line with the demand for end-use products. Product-manufacturing companies have been adopting new operational methods to minimize cost by shortening the production time and lowering inventory costs. Companies operating in the metal fabrication market are adopting new business strategies in order to meet the changing requirements of customers. Metal fabricator companies have the opportunity to efficiently manage operations by using material requirements planning (MRP), Kanban (JIT), and optimized production technology (OPT) to meet the changing requirements of customers and remain competitive in the market. The metal fabrication market in Europe has been experiencing sluggish growth for the last few years. On the other hand, the metal fabrication market in developing countries such as India, China, and Brazil is expected to expand at a rapid pace in the near future. China and India are key countries of the global metal industry. These countries provide lucrative opportunities to companies operating in the metal fabrication market. Major players operating in the metal fabrication market have adopted expansion and mergers & acquisitions as their key strategies in order to expand their network. In January 2017, O’Neal Manufacturing Services merged four affiliates: Aerodyne Alloys, United Performance Metals, Plus Ten Stainless, and Vulcanium Metal International in order to form a high-performance metal company called United Performance Metals. The merger helped the company achieve high operational efficiency. Expending current facilities is likely to be a long-term strategy of metal fabrication manufacturers. For example, in June 2016, high-precision Mitsubisihi laser cutting carbon dioxide equipment was ordered by Komaspec to cut metals with thickness of up to 16 mm. The newly added capability would help the company meet the risen demand for metal fabrication products. Asia Pacific held a prominent share of the global metal fabrication market in 2017, owing to extensive research and development activities in Japan, China, South Korea, and India. Construction and automotive are focus segments of the metal fabrication market in Asia, owing to strong presence of construction and automotive companies in China and India. Japan is a key country of the metal fabrication market in Asia Pacific, due to high R&D expenditure in the country. Key players operating in the global metal fabrication market are Kaman Corporation, O’Neal Manufacturing Service, BTD Manufacturing Inc., Matcor-Matsu Group Inc., Mayville Engineering Comp. Inc., and Defiance Metal Products Inc. The report comprises detailed value chain analysis, which provides a comprehensive view of the global metal fabrication market. The Porter’s Five Forces model for the metal fabrication market has also been included to help understand the competition landscape of the market. The study encompasses market attractiveness analysis, wherein service and end-use industry segments have been benchmarked based on their market size, growth rate, and general attractiveness. 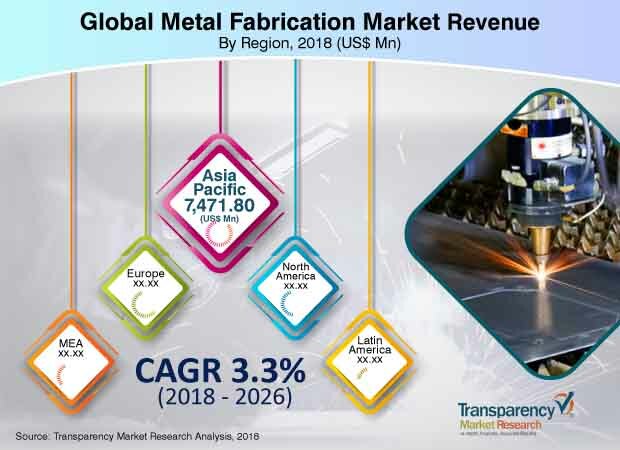 The study provides a decisive view of the global metal fabrication market by segmenting it in terms of service and end-use industry. These segments have been analyzed based on the present and future trends. Regional segmentation includes the current and projected demand for metal fabrication in North America, Europe, Asia Pacific, Latin America, and Middle East & Africa. The report also covers the demand in individual service and end-use industry segments of the market in every region. Key players operating in the global metal fabrication market are O’Neal Manufacturing Service, BTD Manufacturing Inc., Ironform Corporation, Mayville Engineering Comp. Inc., and Defiance Metal Products Inc. Market players have been profiled in terms of attributes such as company overview, financial overview, business strategies, and recent developments. The report provides size (in terms of value) of the metal fabrication market for the base year 2017 and the forecast between 2018 and 2026. Market numbers have been estimated for service and end-use industry segments of the market for metal fabrication. Market size and forecast for each major service and end-use industry segment have been provided for the global and regional markets. In order to compile the research report, in-depth interviews and discussions were conducted with several key market participants and opinion leaders. Primary research represents a bulk of research efforts, supplemented by extensive secondary research. Annual reports, press releases, and relevant documents of key players operating in various end-use industries were reviewed for competition analysis and market understanding. Secondary research also includes a search of recent trends, technical writing, Internet sources, and statistical data from government websites, trade associations, and agencies. This has proved to be the most reliable, effective, and successful approach for obtaining precise market data, capturing market participants’ insights, and recognizing business opportunities.